Commercially available glycol chillers are expensive. There is no way around it. They start around $1000 US and go up from there based on capacity. Then you need to buy your glycol and all the temperature control to actually use the cold glycol. And finally, you need some sort of way to transfer the heat into the glycol; either an exchanger, jacketed vessel, or an internal coil. If you are like me, you got into home brewing to make good beer. Doing it cheaply was a secondary point, but still a necessity for many of us - which makes the commercial chillers out of reach. This article is about how to DIY your own for under $200. Many times throughout brewing a batch of beer involve cooling. There are a variety of ways to do this; flooding with tap water through an exchanger, using ice packs, moving your beer in and out of a fridge, but none are as easy to control as cooling with fluid, specifically glycol. The problem with all of them other than a glycol chiller is they cannot be automated. With a glycol chiller you can set you desired temperature and walk away. No more adding ice, no more using tons of water, it just works. The main disadvantage is cost which is why I built my own. 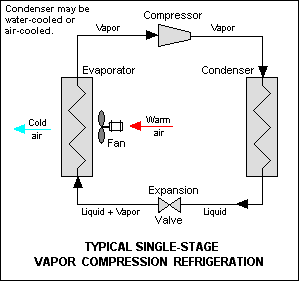 First, a couple of notes on refrigeration. There is no way to get rid of energy, we can simply move it form one place to another. Refrigerators and air conditioning units are examples of this. They move heat from inside one area to outside of it. For our glycol chiller we will focus on an AC unit as it will be the easiest to modify for our purposes. Commercially available units start around 2300 BTU/hr. They are purpose built glycol chillers and will be more efficient than you DIY made one. I would at a minimum aim for an AC unit with a rating of at least double that, 5000 BTU/hr. The more you want to chill, the larger the needed capacity. Portable units that have the exhaust hoses that go out your window are ideal as during the summer you will be able to use those to stop from heating your house, although window mounted units will work as well. I went with a portable room AC unit with a rating of 12,000 BTU/hr. This is about the largest unit you can get that will plug into an outlet in your house. It is a fair bit larger than I need, but that won't matter. Here is a picture of the one I bought. I would recommend finding the cheapest one used that you can. There is a chance you will break the AC unit and not be able to use it. Fixing the unit will cost more than finding another used one. Before you start, make sure it works well. If it can't cool air, it certainly won't be able to chill glycol! Once you have the AC, it's time to tear it apart. The casing has to come off so that you can find the evaporator. The evaporator will look like a radiator from your car, it will be what the AC unit pushes air through to cool it. There will also be a condenser. It also looks like a small radiator from your car. 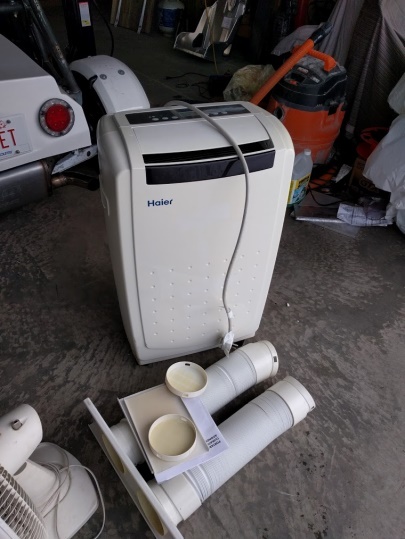 This will be what the AC unit used to get rid of heat. If you are not sure which is which plug in the AC and turn it on and let it run for a bit. One will get cold, one will get hot. You are after the cold radiator. Wikipedia has a good picture of a refrigeration cycle. The evaporator (cold radiator) will have a fan attached to it that you no longer need. Some AC units will not run with this fan disconnected; mine ran fine without it. Disconnect it and see if the unit still works. If it does, remove the fan as you do not need it. The condenser (hot radiator) will also have a fan. We need this fan for the AC unit to work - do not remove this fan! Sometimes the fans are ran by the same motor in really cheap AC units. Usually, though, they are separate. These motors typically run on 120V, so be careful! Next you need to find the temperature sensor. It is almost always on the cold side of the evaporator. It will typically have 2 wires running to it and be about the size of a pea. This is what the AC unit uses to decide if it is going to turn on and off. Do not damage this, as you will need to use it. If it is attached to the evaporator you will need to remove it from the evaporator without damaging it. In this picture you can see the evaporator from my AC unit. I was seeing how cold it would go with no air running though it (-21°C). Your glycol needs to be mixed so it does not freeze until below this temperature. It will vary from unit to unit. On my unit the temperature sensor is in the small white plastic box on the top right corner of the evaporator in the picture. Next comes the part where you can damage your AC unit beyond repair. Perform this step outside! Remove all the pieces holding your evaporator down so that it is only held in place by the tubes going to and from it. You are going to have to bend these tubes to move your evaporator into your cooler. Look at the length of tube on your AC unit to see what you have to work with. They are typically copper, which bends easily. Be very careful not to kink the tubing. Go slow and spread bends out as far as you can. IF YOU HEAR ANYTHING THAT REMOTELY SOUNDS LIKE HISSING YOU HAVE BROKEN THE TUBE AND THE REFRIGERANT IS LEAKING. THE AC UNIT IS NOW BROKEN AND UNUSABLE. RUN AWAY AND LET THE REFRIGERANT DISSAPATE BEFORE COMEING BACK. IF YOU ARE INDOORS, OPEN ALL YOUR WINDOWS AND DOORS AND GO OUTSIDE FOR AT LEAST 15 MINUTES. MOST REFRIGERANT IS NOT TOXIC, BUT IT WILL DISPLACE OXYGEN AND YOU CAN SUFFOCATE. SOME UNITS USE PROPANE WHICH IS FLAMMIBLE AND EXPLOSIVE. PROPANE IS HEAVIER THAN AIR AND WILL SETTLE IN YOUR BASEMENT. CALL A PROFESSIONAL IF YOUR AC UNIT USES PROPANE AND YOU VENT IT IN YOUR HOUSE. If you managed to get the evaporator into your cooler you should have something like this. I have already added the glycol to my cooler in the picture. You can add the 50/50 glycol water mix now. The tricky part is to figure out how to trick your AC unit to turn on and off when you want. If you are confident in your electrical ability you can re-wire the AC unit to your temperature controller directly and bypass all the AC unit internal electronics and circuit boards. This would be beyond most people’s capabilities (including myself). The easy way is to just fool the AC unit into thinking it is hot. This can easily be done by putting a low wattage (like 20-40w) incandescent light bulb near (not too close to) the AC temperature sensor. Next, plug in your temperature controller and put the probe in the glycol (make sure it can be wet first of course). Plug some sort of small heat source (such as a desk lamp) into the "cooler" plug on your temperature controller. Set the controller for -2°C (28°F). If you have it hooked up right it should turn on the light. Put the light near enough the temperature sensor so that the AC unit turns on. You will have to experiment with this and see what works for you. At this point whatever you now have a temperature controlled cooler full of glycol. Now you need to figure out what you plan to do with it. If you are going to use it to chill your boil, you'd typically have a pump running the glycol through one side of either a cross flow, or plate exchanger with the wort running through the other side. The glycol will return back into the cooler. For cooling wort you can just have the pump running non stop as you want to cool as fast as possible. In this case make sure you set the glycol temperature above freezing or you could freeze your wort! If you are using it to chill a fermenter you will need either a coil in the fermenter, or around the fermenter, or a jacketed vessel. You can get premade stainless coils made for this purpose or make your like an immersion wort chiller. However, while copper is fine for chilling wort, it should not be used in a fermentor or with finished beer - the acidity can lead to leaching toxins from the copper. Check for leaks before you use anything. Propylene glycol shouldn't kill you but it will ruin your beer. To do this you would take a second temperature controller hooked up to a pump. The pump will pump glycol through your coils or jacket. This temperature sensor will need to be in the beer. You set this one to whatever you want the beer be at. If the beer gets too warm it turns on the pump which moves cold glycol through the coil which cools your beer. When your beer gets to the right temperature it turns off the pump. 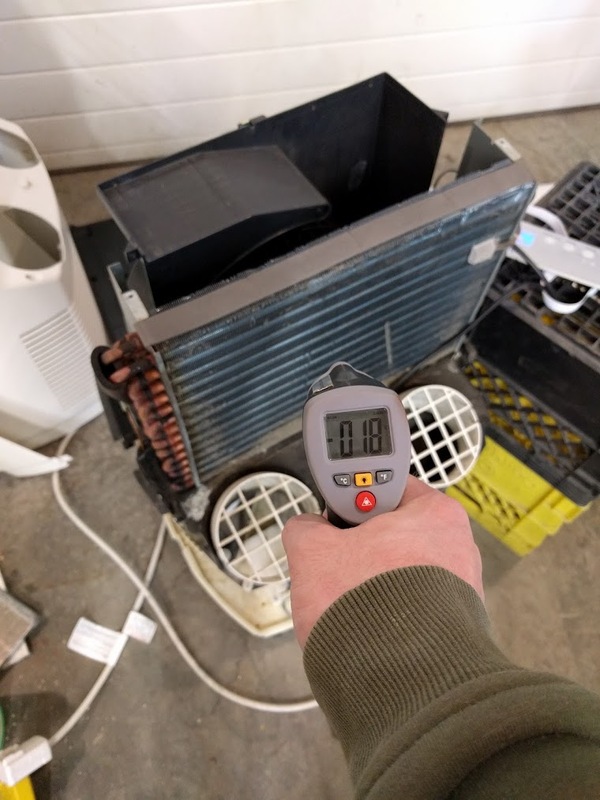 For maintaining fermentation temperatures you probably want to set the glycol temp to ~5°C or warmer so you don’t shock your beer every time it starts cooling. It needs to be at least 5°C colder than you want your beer to hit though or it won't be able to cool at all. For cold crashing you are going to want to set your glycol to around -1/-2°C. You will need to see how cold you can set your glycol before you start freezing your beer. Be careful with this until you know what works for you. As a side note, you can use this system to cool anything you want. Want your taps to be in your kitchen and your kegerator to be in the basement? No problem. Just run glycol lines around your beer lines and add another temperature controller, and you will always get cold beer. 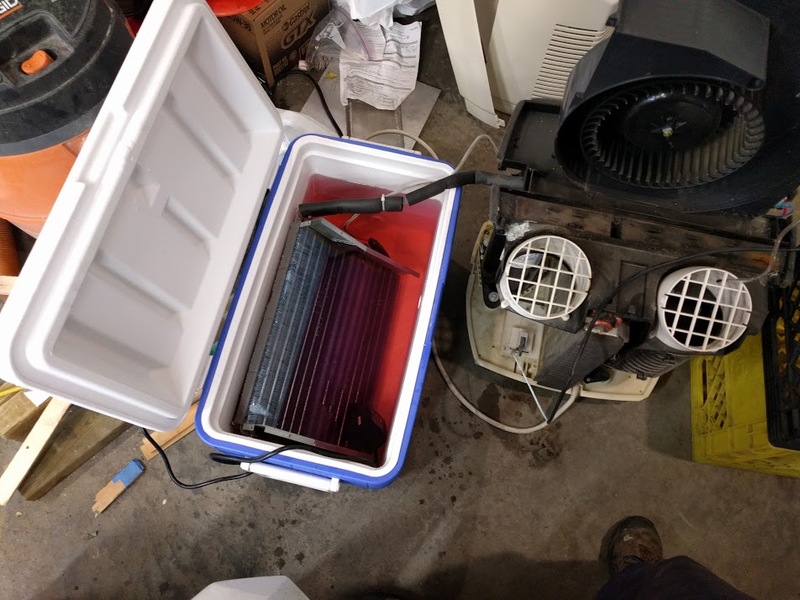 Add a pump in the cooler that just recirculates the glycol on the evaporator coil whenever the AC unit is on. This will help the evaporator work as efficiently as possible. It will work just sitting in the cooler, but it will use more power. Easy way to do this is have your glycol temp controller turn on the desk lamp and the pump at the same time. Great write up! Been reading and building one myself now with a 12,000 BTU window AC. This has two temp sensors, the second is on the evaporator coil, I guess to sense if it gets too cold. I was wondering is there a risk if the evaporator gets too cold? Worried it would freeze up or something!